vpiforum.com • View topic - They went digital, would you? They went digital, would you? The early commitments to go digital with recording devices was a risky decision. There is a long thread about the reasoning involved and a company that formed because of it. What they did might surprise you. Re: They went digital, would you? Mr_Putty wrote: The early commitments to go digital with recording devices was a risky decision. There is a long thread about the reasoning involved and a company that formed because of it. What they did might surprise you. First, I have to say that I like digital recordings as a rule. Brothers in Arms, for example, is incredible on vinyl even though it was recorded and mixed digitally. With that said, I think the very best, most musical recordings that I own are predigital era. If you can ignore the tape hiss, the music is magical. Where’s the ‘Like’ button? Saweet, Rock on! are those sneakers or some new type of room treatment ???...lol. Sure looks like you're "roughen' it" in that Cabin When (if) I ever get ready to buy, I will definitely look you up! 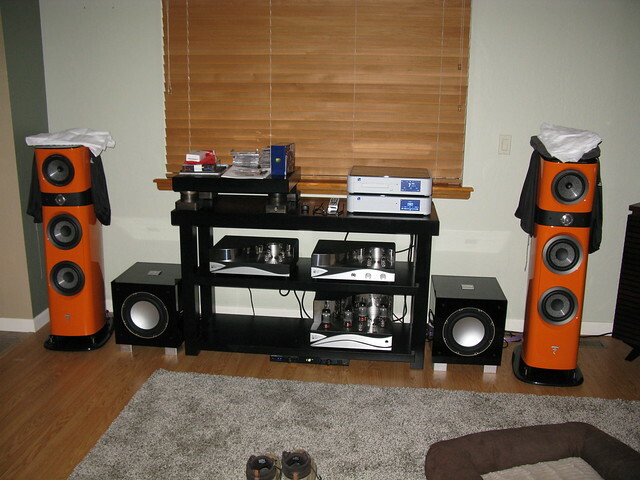 This is another picture like what was shown the other day, where the speakers are obviously extremely close to the wall. Am I just out to lunch (as usual) and missed the memo on how to make such placement give a reasonable bass response or a reasonable soundstage? Or are these systems blessed with appropriate software fixes to mitigate the obvious problems of speaker placement? Or am I just the only one who is curious about why I can't place speakers in this manner and expect to be pleased with the result? Or ... Or ... Or ... ?